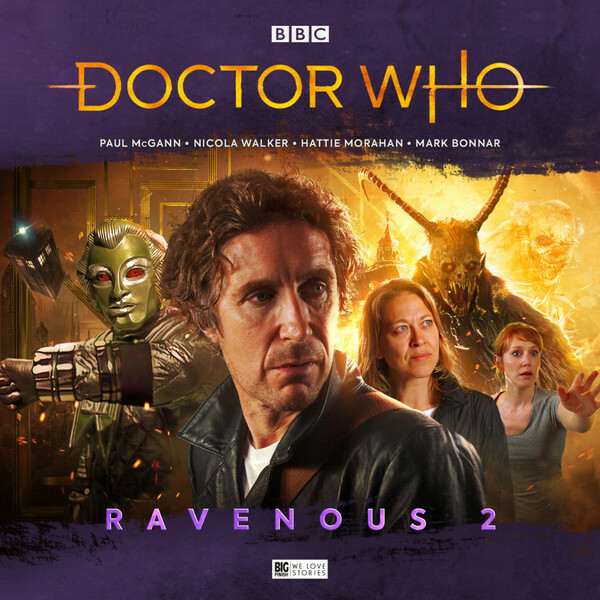 This 5CD set sees the Eighth Doctor (Paul McGann), Liv Chenka (Nicola Walker) and Helen Sinclair (Hattie Morahan) visit friend and foe alike in the shape of renegade Time Lord the Eleven (Mark Bonnar) and Liv’s sister Tula (Claire Rushbrook). The Doctor tries to take his friends somewhere relaxing, but both a visit to Liv’s home and a festive treat in Austria are filled with more danger than the Doctor bargained for. Meanwhile, the true horror of the Ravenous threatens to emerge from the shadows... The set boasts the return of old favourites the Kaldor robots (from classic Fourth Doctor adventure The Robots of Death) as well as recurring Eighth Doctor audio villain the Eleven. There’s plenty new to be found as well, with a decidedly demonic double-length Christmas adventure and the first appearance of the titular Ravenous bringing an element of horror to the fore.